No equipment. Try this actual foundation makeup SPRAY. 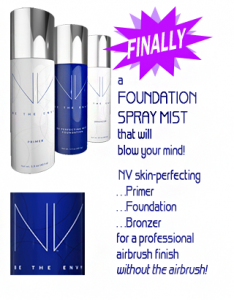 NV Foundation Spray – Jeunesse NV BB Perfecting Mist Foundation, and now NV Primer, Bronzer and Shimmer blur skin imperfections and deliver photo-ready coverage fast. Talk about convenience while hydrating and nourishing our skin! Enjoy this video. And, we love this . 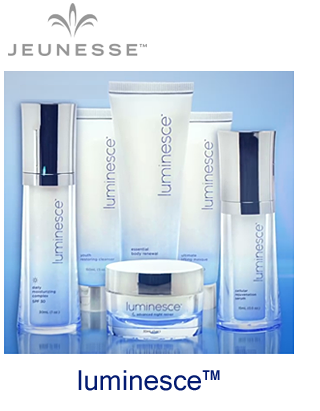 . .
You can match YOUR CURRENT shade by Manufacturer, Brand and Color on the Corporate Jeunesse NV Foundation page. 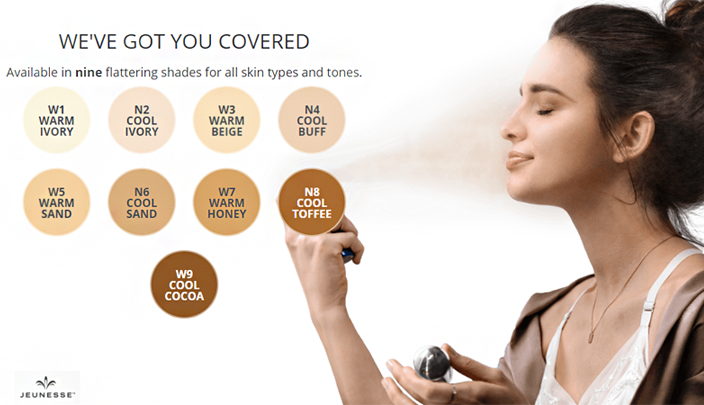 NV BB Perfecting Mist Foundation blurs skin imperfections and delivers photo-ready coverage fast. LIGHT COVERAGE: Mist spray once over face. MEDIUM COVERAGE: Mist spray twice over face. FULL COVERAGE: Mist spray three times over face. There is also a PRIMER and a BRONZER. All OIL-FREE. NV Foundation lives up to its name and includes these beauty balm benefits. “BB” is short for “beauty balm.” Think of NV BB Perfecting Mist Foundation as a double agent. Because it’s an innovative foundation that can be used as a concealer to camouflage under-eye bags, skin imperfections and even tattoos! Created by a celebrity makeup artist, NV is a luxury makeup line designed to deliver high-definition results for a flawless, airbrushed look that gives your skin Beauty With Benefits. Formulated with our exclusive APT-200 and moisturizing aloe, NV features skin-healthy ingredients to nourish all skin tones. 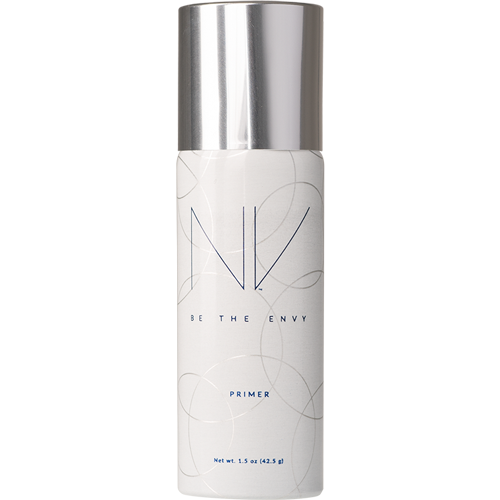 NV Primer fills in fine lines while extending the wear of your NV BB Perfecting Mist Foundation. This 5-in-1 product primes your skin, lips, eyebrows, eyelids and eyelashes in seconds! Create a subtle glow that is light weight and oil free. 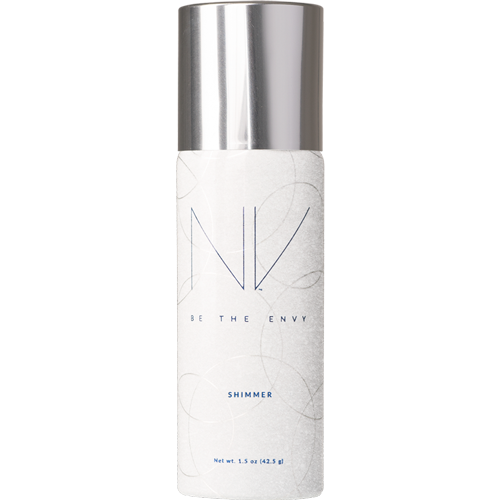 NV Shimmer illuminates your skin, creating a radiant-looking complexion, ideal for all-day and all-night glamour. NV Shimmer can be used as a highlighter when applied before or after foundation. For a subtle glow, mist NV Shimmer onto face before foundation. 1. Shake NV Shimmer for 5 seconds. 2. Mist into palm or onto an applicator. 3. Apply with fingers or applicator to brow and cheekbones as a highlighter. NV Shimmer can be used as a highlighter when applied before or after foundation. For a subtle glow, mist NV Shimmer onto face before foundation.